This is the fourth in a series of posts about the development of the visual elements of Donna Druchunas' new book: Ethnic Knitting Discovery: The Netherlands, Denmark, Norway, and The Andes. Today's topic is the technical illustrations. My explanation feels to me a little klutzy. Although all of the illustrations in Ethnic Knitting Discovery required painstaking attention to detail, the technical illustrations demand almost superhuman concentration from everyone involved in creating them. I feel like it takes too many words to explain what we did! The copyright page of the 2002 (updated) edition of Vogue Knitting: The Ultimate Knitting Book credits more than fifty people who contributed to that book's writing, editing, illustration, and photography (8 editors, 1 art director/designer, 1 project director, 2 illustrators although one of them is "and associates," 2 design assistants, 5 contributing writers, 3 photographers, 3 people doing charts and schematics, 2 consultants, and 35 contributors, including people like . . . to pick a random handful . . . Norah Gaughan, Annie Modesitt, Deborah Newton, and Dorothy Radigan; major shifts from the 1989 edition involved an extra design assistant and a change in responsibility for the fashion photography). It's easy to understand how the work involved that many folks! 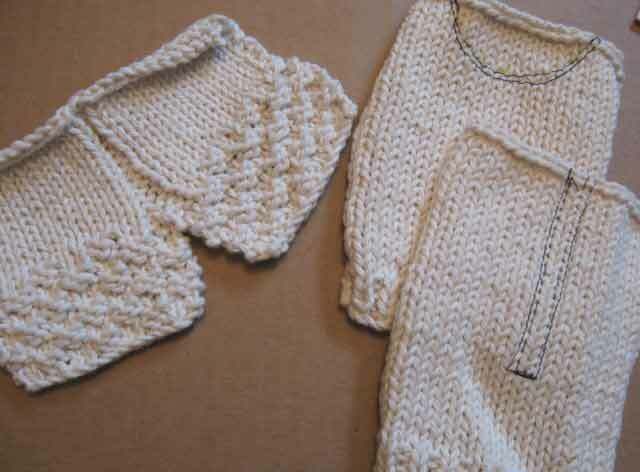 Because of the complicated and then condensed schedule for Ethnic Knitting Discovery, both Donna and I generated reference materials for the technical illustrations and two illustrators, Joyce M. Turley and Gayle Ford, produced the final images. Gayle works exclusively by hand, and her drawings have a characteristic delicacy and astonishing level of detail. She has provided illustrations for a number of Interweave Press publications for many years and got Ethnic Knitting Discovery off to a good start. When changes in the production schedule left us needing to generate additional illustrations quickly, Joyce—whom I'd met almost by chance at last fall's conference for the Publishers Association of the West (PubWest)—pitched in. She uses a combination of hand-drawn and electronic processes, which made it simple for us to put color in a few of the demos where that contrasting component really comes in handy. She works in a variety of styles and the one we chose together for these illustrations gave us speed (which we needed) without sacrificing clarity. It's incredibly helpful, almost essential, when an artist who is illustrating knitting (especially techniques) knows how to knit. Even when the person does have that ancillary (in this case) skill, the reference materials need to point out without a doubt what the drawing needs to show: where the emphasis needs to be, and what particular aspects of the technique the knitter needs to focus on in each drawing. 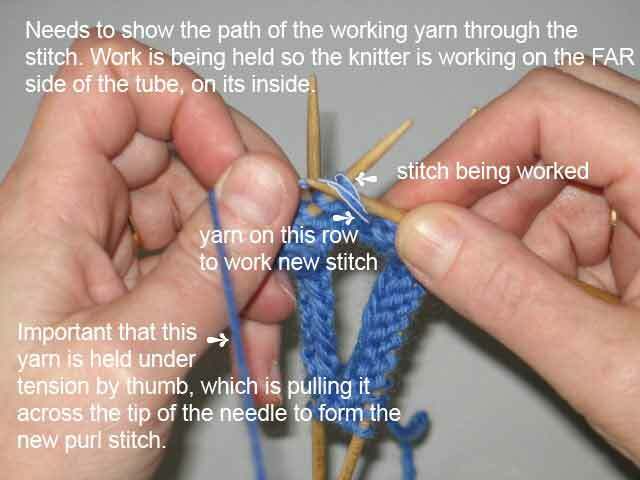 This post won't show the finished drawings, in part because anyone who reads knitting books or magazines is constantly exposed to completed work of this type . . . although mostly because the post would be even longer than it is. Instead I've got plenty of background images to share as I talk about what happens behind the scenes. You can't readily find that stuff elsewhere. If you need to illustrate techniques, you can, of course, simply photograph the objects or the steps in a process and print those pictures. Sometimes that's the right way to go about conveying information. However, I think that the two-step process we went through—making a swatch or samples and then working either directly from the yarn (or swatch) or from a photograph of it—served this book best, in terms of both ease of use and the book's overall aesthetic flavor. The book itself is a work that requires artistic integrity, although for a book of this type the reader's ability to learn easily from it trumps all other factors. This series of posts separates the overall illustration project into several subsets. Similarly, the technical drawings themselves were subdivided into types. 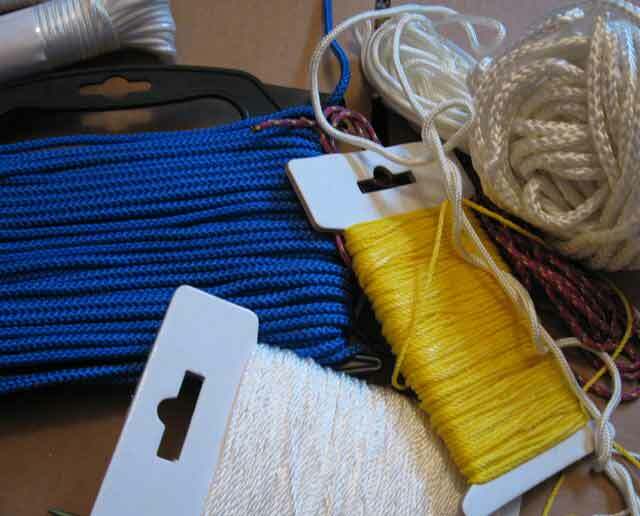 Some required us to show swatches at different stages; some showed body positioning in relation to the knitted work; still others showed the formation of individual stitches or sets of stitches. Although I'm not going to divide this post by these subtypes, you'll see some of each. 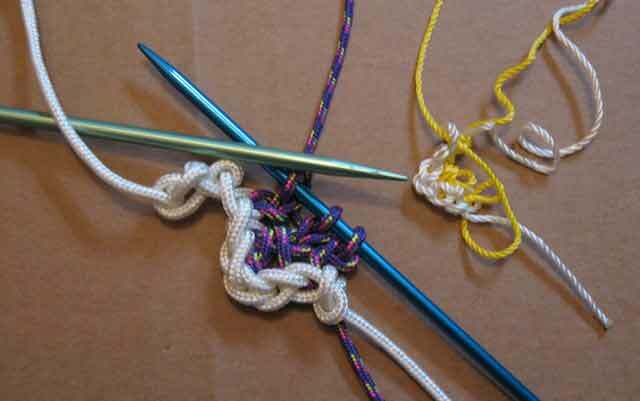 In some cases, we needed to knit swatches to show techniques. The objects below represent less than half of what we had for each of the techniques they show. On the left is a swatch showing a lower-edge finishing technique used on Danish sweaters. It's the final in a series of three; we ended up showing the middle image only. We used the same sample for all three, so the preliminary stages got absorbed in the final. Side note: I was also playing with a personal inquiry on this swatch, which is why the patterning in the lower part (below the bottom of the steek) is more white-dominant than that in the upper part. 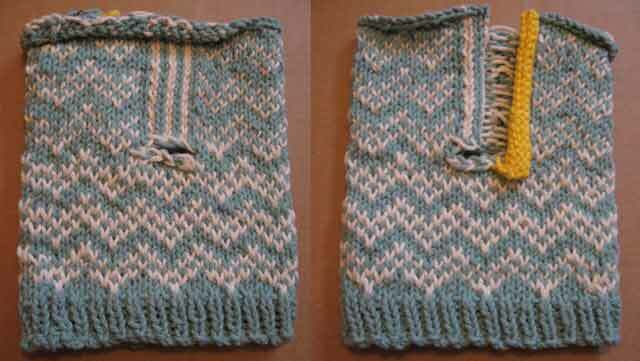 The difference occurred because I knit two-color patterns with one color in each hand, and I switched which color was in which hand. All of those swatches were knitting in worsted-weight cotton yarn (Sugar 'n Cream and similar stuff), which makes the stitches easy to see while producing a swatch that isn't so big it's hard to handle. Some illustrations need to show the knitter's body or fingers in relation to the forming textile. 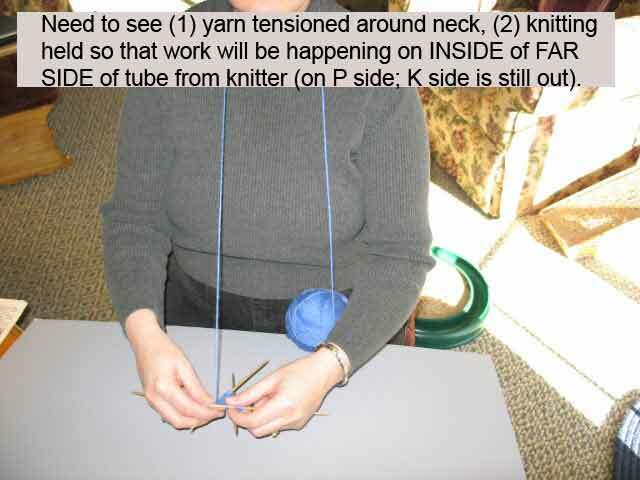 Here's Donna's reference image showing the fundamental information on how to hold a piece of Andean knitting. This is a pretty small piece of knitting, so we enlarged how it looked in the final (the lower drawing on page 135, by Joyce). By the way, the illustration developed from this image contains the only error we've found so far in the first printing of the book. 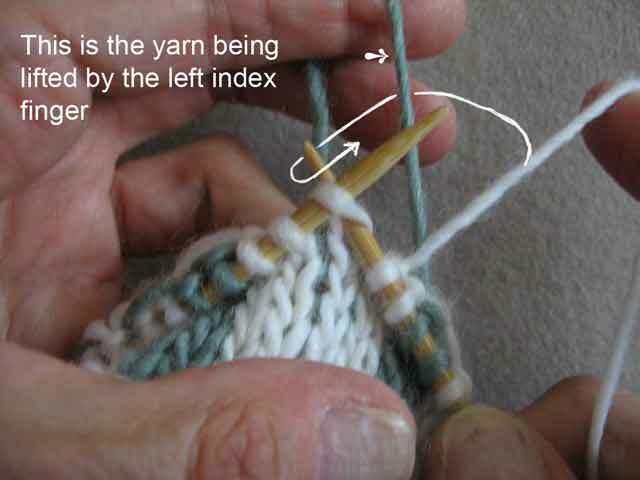 It was my fault: I approved the final without noticing that the arrow goes behind both strands of (green) yarn, instead of just one, as in the reference (it's correct in the photo). This is my problem, not the illustrator's, because drawing requires enough intense concentration that the drawings definitely need to go back to the technical editor for final sign-off. Ideally, I would take the drawings and use them, with needles in hand, to reproduce the actions shown and see if I got the appropriate results . . . essentially, pretending that I don't know the technique and only have the information in front of me to go by. We got these drawings together very much later in production than usual and I trusted my eyes. Bad idea. 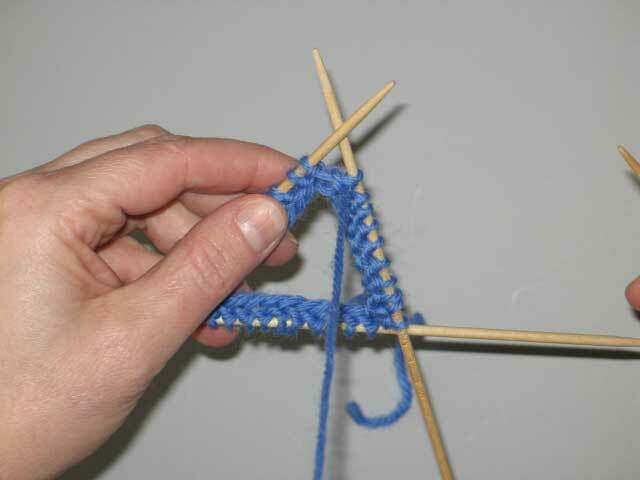 Where knitting is concerned, the fingers—holding yarn and needles—are much more reliable. The yarn in that last example is Brown Sheep worsted-weight singles, which is one of my standby sampling yarns. You'll note that we were both using yarns that were neither too dark nor too light to show stitch definition clearly in photographs. However, it was still too hard to see what was going on in this technique, so I reworked at a larger scale. The multicolored cording (left over from a successful knotting experiment) is visually way too busy, but I had it so I made do with it. The knitting needles are two different colors, again to help the illustrator differentiate all the elements in the scene. The green needle is just lying there because I'd just completed one step on the sample and hadn't started the next. The best solution is whatever works to convey the information as clearly and quickly as possible—first to the illustrator, and then to the most important person in the equation, the reader. I always like to make sure that the illustrations are reproduced large enough that a knitter can use them while the book is sitting open on a table or lap and the knitting is actually in hand. I also work with the layout to assemble both words and images relating to a technique on the same page or spread (a spread is a set of two facing pages), if that's humanly possible. If the reader has to turn a page while executing a technique, I do my best to put the split at a logical point.